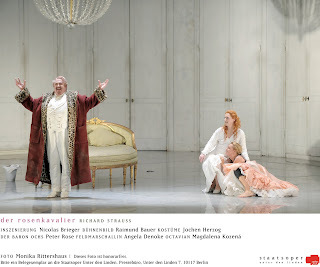 Nicolas Brieger’s production of Der Rosenkavalier for the Staatsoper Unter den Linden resembles the work itself in one very important respect. I do not mean that every stage instruction is taken as holy writ, that we enter the false immediacy of a Rococo paradise, after the manner of the venerable Munich production of this work. Rather, Brieger recognises – for I am reasonably sure that this cannot be mere coincidence – that Strauss and, perhaps to a lesser extent Hofmannsthal, are engaged in, amongst other things, a study in anachronism. So we have an eighteenth-century base but a number of deviations therefrom, not usually so as to alienate, but so as to remind us that we are not really in Maria Theresa’s Vienna at all. Some touches work better than others, but the general idea seems sound. The first act takes place in what looks like an eighteenth-century ballroom. After a problematic and quite avoidable opening, in which we bizarrely discover the Marschallin and Octavian sleeping on the floor, Raimund Bauer’s mise-en-scène permits not only a great deal of comings and goings but also a certain distanced starkness, which suggests that, for all the whipped cream, this is an early essay in neo-classicism. The stillness of most of the ensemble during the Italian aria heightens this effect and also allows us to concentrate both upon the singer and upon Ochs’s dealings with the notary. It is not at all clear to me, however, why the singer should be in a wheelchair; that simply seemed odd. Some might find the substitution of a dwarf for Mohammed offensive, although the role was winningly portrayed. Faninal’s palace brings us closer up to date: an interesting idea, which worked rather well. The feudalism of the ancien régime will before long be superseded by something closer to the world of composer and librettist. I liked the touches of nouveau richesse , such as the old-world globe, which, upon the flick of a switch by the surpassingly elegant major-domo (Patrick Vogel), doubled up as a light and, a little later, was revealed also to serve as a drinks cabinet. Yet there were also quite a few loose ends. Why should Ochs, of all people, sport a cloak with leopard-skin lining? And why should his men appear as the roughest of peasants? Slightly tatty livery would have been more to the point. The designs for the third act once again worked well; there was a hint of the artificial outdoors, suggesting to me a Straussian glancing back to the final act of Figaro. Angela Denoke showed that she is an estimable singing actress, her every glance charged with meaning. She enunciated clearly for the most part but showed some signs of strain at the top of her range. This seemed more pronounced than it had done last summer in Munich. Peter Rose was an impressive Ochs. I have witnessed greater charisma but also greater caricature. His handling of Hofmannsthal’s difficult German, often at great speed, was thoroughly idiomatic, a point confirmed to me by German friends, who were astonished to hear that he was not a native speaker. Hans-Joachim Ketelsen was equally impressive as Faninal, alert to the shifting implications of words and music, and a good actor too. The Italians did their usual stuff, with the usual aplomb, no less worthy of mention for that. Unfortunately, there was one fly in the musical ointment: Sylvia Schwartz’s Sophie. I find myself impatient with the character at all but the very best of times; why should anyone prefer that insipid bourgeois girl over the graceful aristocrat with whom every opera-goer has surely fallen in love? Schwartz, however much she looked the role, forced her voice unnecessarily throughout and was often severely sharp. Thankfully, there was great compensation in Magdalena Kožená’s Octavian. This run, of which the present performance was the last, marked her debut in the role, but she exuded confidence born of a properly vulnerable boyish swagger. Her diction was superb, as was her musical line. Like so many in her role, she somehow seemed more convincing as a woman in the role of a boy dressed as a girl than merely as a woman in a boy’s role. I was greatly impressed by the awkwardness of her gait in the former guise: not overdone but nevertheless apparent. It was good to note the presence of her husband, Sir Simon Rattle, in the audience. Asher Fisch proved a reliable guide to the score, for the most part able to elicit a good hearing for the Staatskapelle Berlin’s wonderful ‘old German’ sound. There was a natural ebb and flow to the first two-and-a-half acts, and there were some interesting and convincing departures from tradition, notably in the furious openings to the second and third acts, which nevertheless led audibly into the musical drama that followed. Sadly, the tension sagged during the final half hour or so, reversing the typical situation, in which the arrival of the Marschallin prompts the cast and even the audience to better their collective responses. 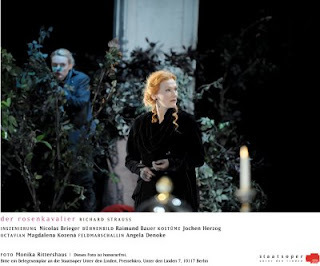 This remained, however, an enjoyable Rosenkavalier, a performance serving to remind this listener of why, whatever reservations he might occasionally entertain in the abstract, he loves the work very dearly in practice.